Well what do we have here? A Hodag and a Jackalope! Looks like our friends from Wisconsin had a great time during the fatbike naming party. Well, their fatbike called the Farley is a great moniker too so we take our hats off to them for finding original and fun names in this day and age of countless trademarks locked up for product names. 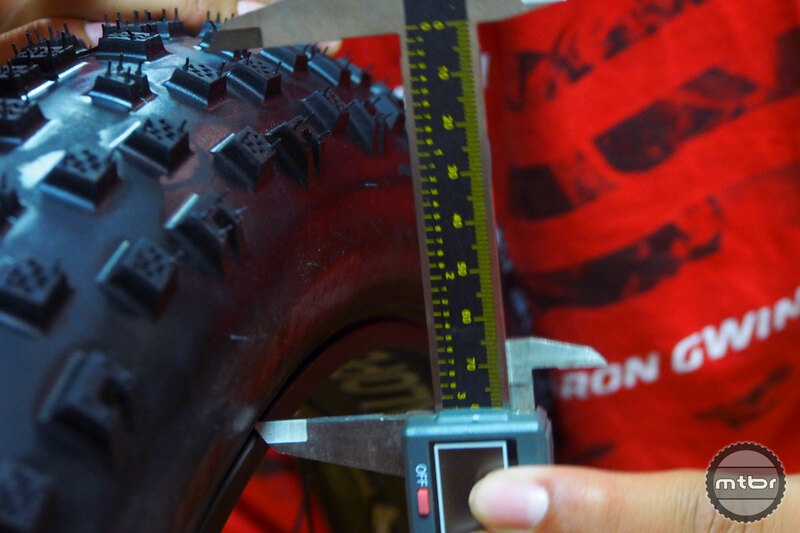 Bontrager has made huge strides in recent years with their line of tires as they’ve employed the services of tire expert Frank Stacy to design and test their tread patterns. Anyone who’s tried an XR3 or XR4 recently can attest to their balance between grip and efficiency. And rubber quality and construction trueness is a familiar asset of these tires as well. That’s why the Bontrager Hodag is an interesting tire. 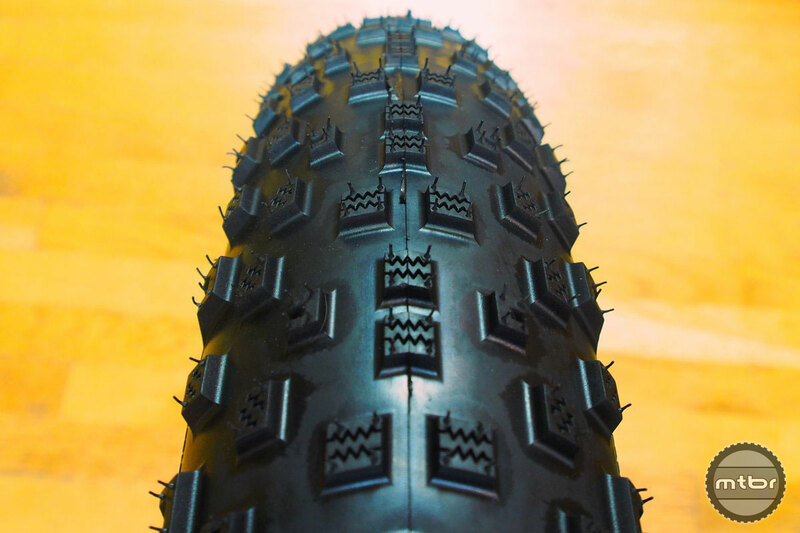 Bontrager brings in their expertise in tire design and brings it to the 3.8 wide Hodag. It weighs in at 1244 grams with the TLR and Inner Strength casing. The Bontrager TLR system is tops when it comes to tubeless and they worked on fit and bead mating issues to maintain a proper tubeless seal. This is key on a fat tire, as the tube itself is over 400 grams, so a tubeless setup can offer significant weight savings. Not to mention that very few riders will carry multiple spare tubes on their fat tire adventures, as the tubes weigh a ton. So the self-sealing properties of a tubeless system are most welcome. Low pressures are the norm for fatbikes too, with 6-8 psi as common riding pressures. At these levels, a great tubeless system is key to avoid burps and loss of seal during aggressive riding. 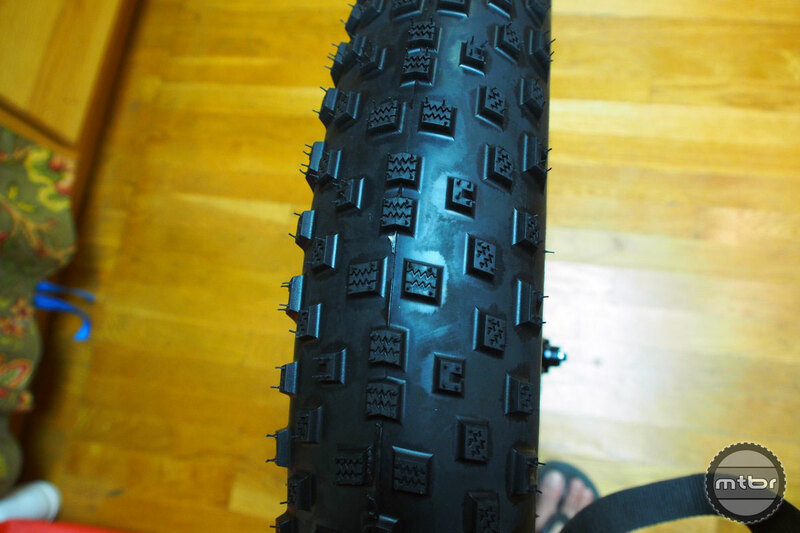 The 26″ x 3.80 wide Hodag fat tire. Inner Strength is Bontrager’s sidewall protection system and it is a good one. It is found on their enduro tires and it prevents sidewall cuts in extreme terrain. Fatbike adventures go through ungroomed and rocky terrain after all, so such protection is welcome. 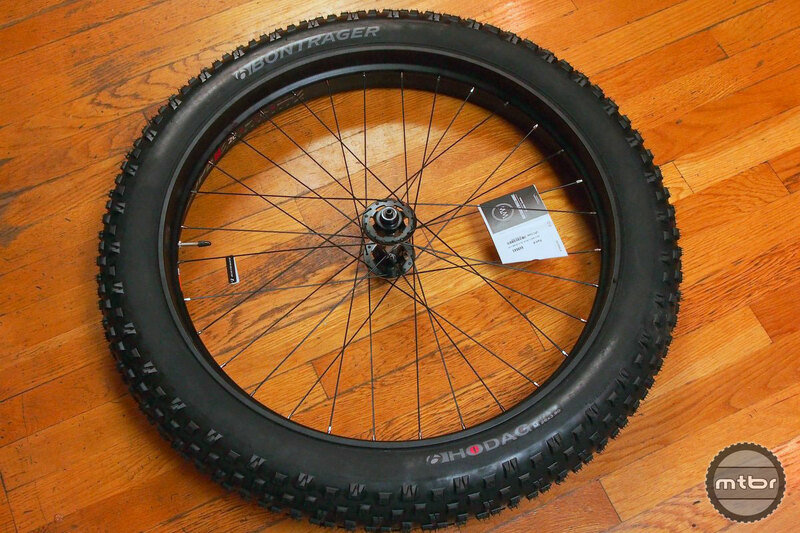 The tire is not big at 3.8, so this tire may be best suited for aggressive trail and XC riding. Perhaps putting this on the new full suspension Salsa or Turner will be a good match. 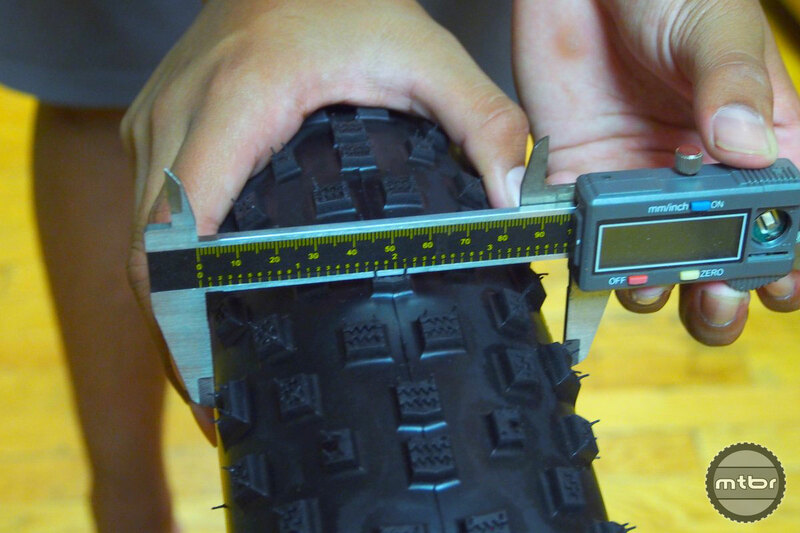 Generally, smaller tires are great for lighter or full-suspension fatbikes, while big tires, like a 5.0 are good for a flotation or expedition fatbikes. Better yet, a Trek full suspension fatbike would be a welcome steed if they ever created one. 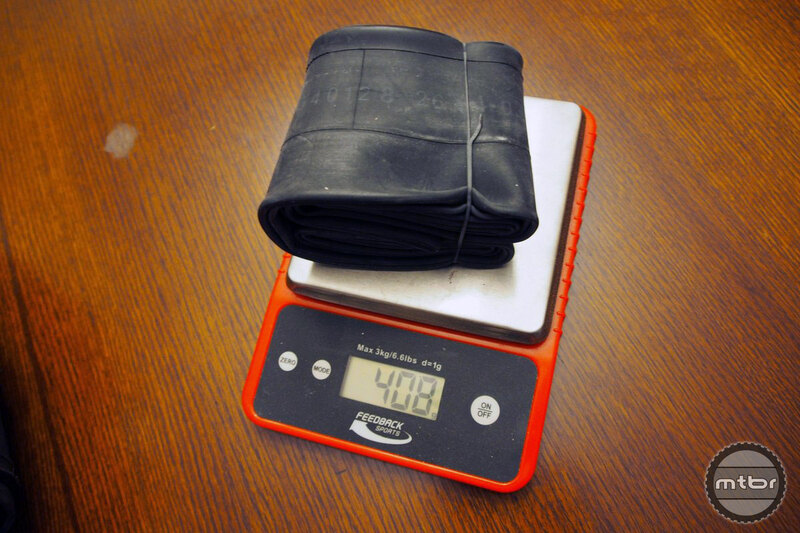 The Bontrager Hodag weighing in at 1255g on our scale. 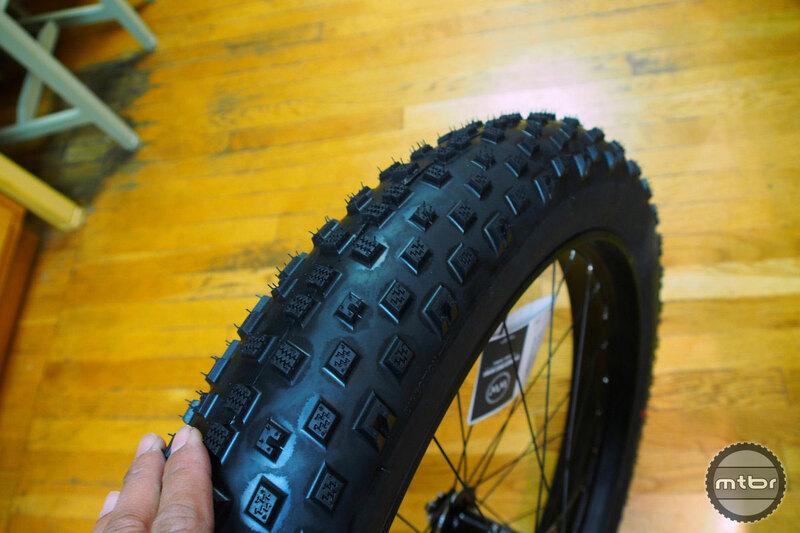 The $150 price tag is indeed a steep one, but such is the landscape these days for fatbike tires. Word is the raw material prices of rubber are sky high these days and these tires use a lot of them. Size is 26 x 3.8 with 60 tpi and a durometer of 60a. 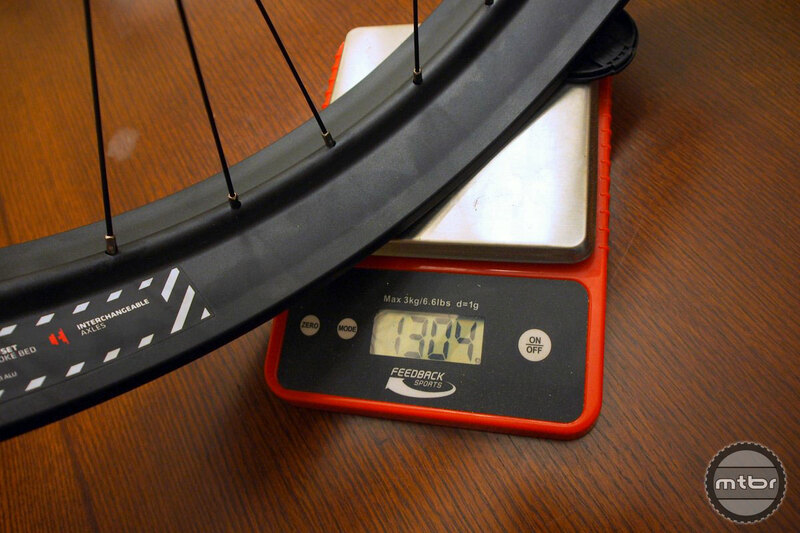 Weight is 1304g on our scale for the QR front and 1552g for the rear wheel. 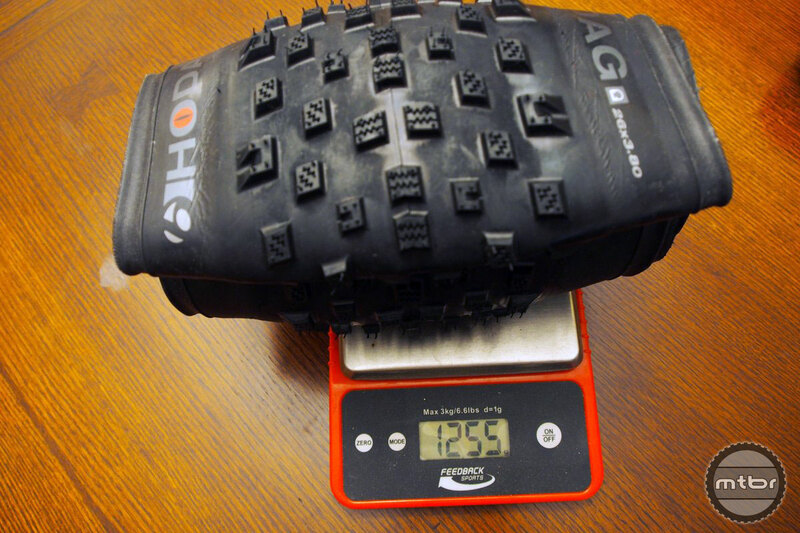 The Bontrager Jackalope is another interesting new product as it brings the company’s TLR system into fatbike tires. It is interesting to note that only a small, channeled strip of the rim requires rim tape as the rest of the rim is sealed. The spokes are offset as well to improve wheel dish, stiffness and stability. Interchangeable axle cups are included as well to accommodate the popular frame and fork sizes. Two front wheels are available with a 135mm QR and a 150mm/15 thru axle for the two standards that exist today. 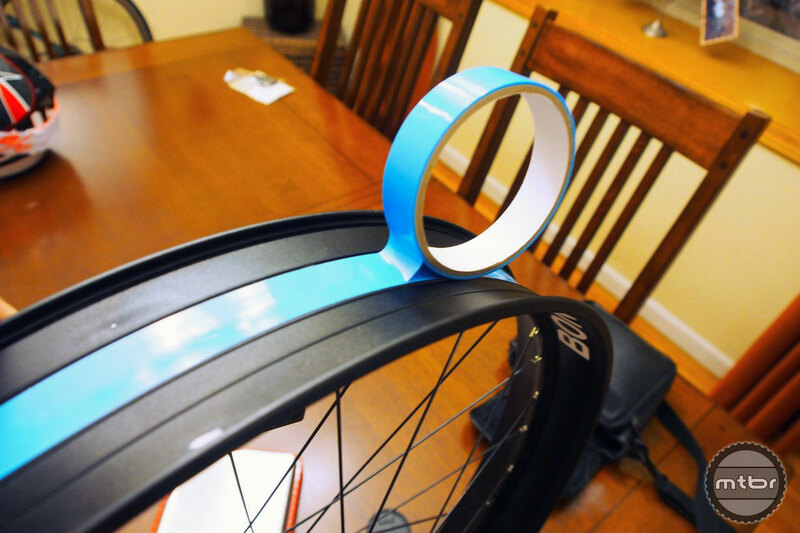 Only a small, channeled strip of the rim requires rim tape as the rest of the rim is sealed. Rim width is 75mm internal. TLR rim tape and TLR valve stem are included with the kit. Pricing is $483 for the front wheel and $517 for the rear. Weight is 1305g for the QR front and 1552g for the rear wheel. 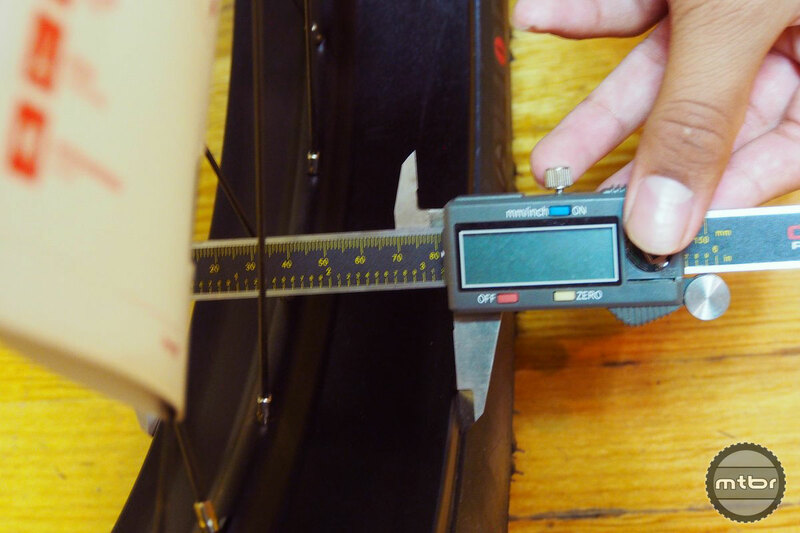 Author should include his measurement of the inner width of the rim where it interfaces the tire bead. I have been running Hodags on my Farley for 3 months. Fantastic performance. I have the tires mounted currently on Northpaw rims. 50mm wide rims. No issues. I have the Jackalope wheels on order and are looking forward to seeing what they offer in performance. Is the 135 front wheel rear or front disc spaced?